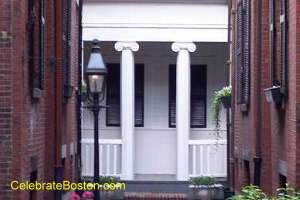 Tucked away on Boston's Beacon Hill is the Scarlett O'Hara House. It's a two-story Greek revival building that blends fairly well with the London style brick town homes of the neighborhood. Actually, the house doesn't really exist at all. It's a three dimensional painting that was put in place more than thirty years ago. The O'Hara "house" was painted to obscure a brick and concrete wall. The detail is exceptional, and a complete illusion is created. It is said that residents hang a wreath on the front door of the "house" each December, and one can notice that the ornamental flower boxes below the "porch" are kept neat and beautiful. It's very easy to walk by the Scarlett O'Hara House without noticing a thing. 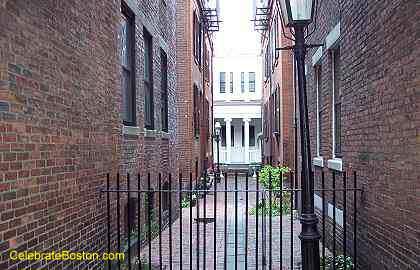 The "building" is located on a private way off Revere Street on top of Beacon Hill. The blue-blooded Lodges, Cabots, and Lowells of 19th century Beacon Hill would have been quite amused by the effectiveness of this illusion. The north face of Beacon Hill is quite steep, and is characterized by large retaining walls to support the structures above at various tiers. If you walk by the Vilna Shul Synagogue on Phillips Street below, you can view the rear side of the retaining wall that supports Revere Street. There are many historic houses on Beacon Hill, but the Scarlett O'Hara House is a quaint local attraction if you are strolling around the neighborhood. Please remember that Rollins Place is PRIVATE PROPERTY, and tourists should never enter the gate. Thirteen Foot House, with a deeded height restriction, is another unique house located a few blocks away on Mount Vernon Street.